The aforementioned features and specs are just a sample of what you’ll get with the 2019 Toyota Corolla. You’ll have access to a variety of safety, technology, and efficiency features that will truly change the way that you drive. Typically, the caliber of specs and features will indicate how much you’re going to pay on a monthly payment. However, with the Toyota Corolla, you can get the features you’re looking for at an affordable rate. Furthermore, this vehicle is powerful and efficient. There is a 1.8-Liter 4-Cylinder DOHC 16-Valve with Dual Variable Valve Timing which will deliver constant power. 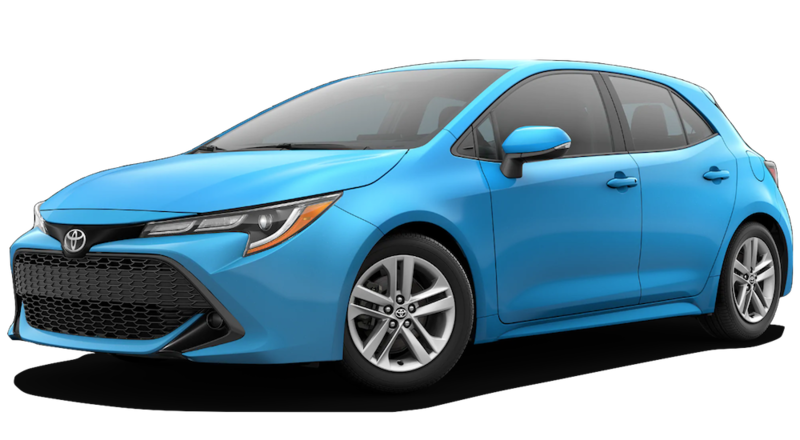 Additionally, the 2019 Toyota Corolla gets about 132 horsepower and 128 pound-feet of torque. Both of these stats truly show how powerful, yet understated the Toyota Corolla is. Additionally, it is also known as an “Ultra Low Emission Vehicle,” which shows that it is efficient. The Toyota Corolla also has a 6-speed manual transmission. It’s no wonder that customers are immensely satisfied with their purchase of the 2019 Toyota Corolla. It has all of the greatest technology and safety features, right alongside a powerful drive system. Typically, one does not think of a Toyota Corolla when it comes to a powerful vehicle, but this model will really surprise you. It is a powerful vehicle for the price tag that you’ll be paying. These features may seem unnecessary to some, but others may not be able to live without them. The great thing about the 2019 Toyota Corolla is that you can select the features that will best suit your needs and leave the rest. If you’re looking for a vehicle that has everything that you need and less of what you don’t, the Corolla is a great option. With the assistance of the Standard Toyota Safety Sense, you’ll be able to drive with a confidence that you’ve never known before. You will be able to navigate a variety of situations with ease. Keep your friends and family safe with the all-new 2019 Toyota Corolla. The best aspect of the 2019 Toyota Corolla is that you can get the best safety, efficiency, and technology features without breaking the bank on a monthly payment. With this many choices to select from, it can be difficult to decide on which one will be your next vehicle. When you factor in the fact that you can add on a variety of features and packages, this vehicle is completely customizable. It’s no wonder that customers love the all-new 2019 Toyota Corolla. Joseph Toyota is your go-to dealership if you’re looking for a new or used Toyota vehicle. Conveniently located in Cincinnati, we’ll be able to help you with whatever your needs are. If you just began looking for your next vehicle or you are well-immersed in the process, let Joseph Toyota handle the hassle for you. They pride themselves on making the entire experience memorable and easy for their customers. There’s no need to settle for a vehicle that you don’t love, or worse, you won’t feel pressured into purchasing a vehicle that you don’t want. At Joseph Toyota, they work with you to ensure that you make an educated decision and at the end of the day, that you end up with a vehicle that will be a part of your family for years to come. If you’re local to the Cincinnati area, you know that there are countless other dealerships to shop with. Your question may be: “what makes Joseph Toyota different?” Well, there are a variety of ways that Joseph Toyota is superior to the surrounding dealerships. One is their pledge to their customers, which is to provide a car-buying experience that is easy, true, and clear.